This article was published in Winter 2015 Nor’Easter for TONE (Tartan Owners Northeast). 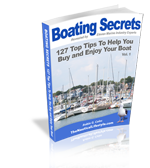 Boaters will tell you the two most exciting days in their life are: 1 the day they bought their boat, and 2 the day they sold it. An inexperienced boater will say the scariest day for them is when they had to be “Suddenly in Command”. Taking the helm when you least expect it and are not prepared is no joke. It is a lot of responsibility and your life could depend on it. That’s why it’s important to make sure your sailing buddy knows how to handle certain things. This [buddy] could be your spouse, significant other, or friend. These “things” are: the radio, engine, first aid, man overboard. Years ago Luke had a heart attack while sailing in the harbor. The only other person on the boat was his wife, Dani. She had never taken the helm before and was now “Suddenly in Command”. According to Dani, she was a nervous wreck. Her husband was sick, the sails were up and her focus was to get back to the marina. She didn’t use the radio. She didn’t call the Coast Guard. Not even to the other boats they knew passing by. Today, if she had to do it all over again, she would alert someone that they were coming in. Last summer a call for help came over the radio. A woman fell overboard and they didn’t know how to get her back into the boat. We did not hear where this person was. They just kept asking how to get her back on the boat. A few minutes later we heard a second incident of man overboard. Both times it was clear the person on the radio was not used to using it. Nor could they give a good description of where they were. In Ray McAllister’s curriculum “Suddenly in Command” he writes about the important use of a VHF radio. He goes on to talk about an incidence where a woman took the helm and radioed for help. The problem was that she did not depress the button to allow others to respond back to her. This I’m sure only made matters worse as she felt like no one was listening. Again, the radio is one of the top four things your mate should know how to use on the boat. Teach them these simple procedures: How to turn the radio on (power it up); How to transmit and to remember that they need to RELEASE the microphone button so the Coast Guard can communicate with them. So remember, when using the radio in a distress situation you simply mention May Day three times. In fact, print off the following instructions, laminate them and place it on your boat where everyone will see it. May Day May Day May Day, give the name of your boat, number of people on board, where you’re located, and the nature of your distress. Always start off saying May Day three times and then the basic information about your situation. Winter edition pages 3,4 17,18.
available in both softcover and on Amazon Kindle.